10+ Stunning Reception Centerpiece Ideas That You Can Steal For Your Wedding! A wedding reception table centerpiece is the cornerstone of any wedding reception decor. It will be the first thing all the eyes will be drawn to when your guests enter your reception. So, the look of your table is paramount! Having said that, whether you opt for bright and bold flowers or small and colorful blooms or eclectic edible arrangements, just make sure your wedding reception centerpiece is eye-catching and reflects your wedding theme. While most couples opt for floral arrangements, the options extend far beyond that. To help you find the perfect fit for your wedding, we've rounded up a list of some really unique ideas and arrangements for the centerpiece. So discover what your options are and get inspired for your own décor. Lanterns also make for really elegant and stunning reception table centerpieces. You can pick some rustic lanterns like the ones below and fill it with candles or flowers to make them more eye-catching. How cool are these mini-chandeliers with crystal balls hanging from them? We say they look super cool and glam! Believe us when we tell ya, your guests will really love these centerpieces at your reception table. We are loving this candle stand decorated with pearls and roses giving a regal touch to the centerpiece. Garlands filled with leaves and flowers make for the most elegant centerpieces for the long feasting tables. We adore this table setting giving off some ‘dining under the stars’ vibe! This usage of solid colour flowers in the centerpiece is a very sophisticated way to balance out the shimmery tablecloth. You can also choose specific flowers as centerpieces which let your colour theme be in sync with your decor. Are you and your hubby-to-be true blue Bollywood fans? Well then you've got to have this quirky B-town inspired centerpiece at your table! We are in awe of this centerpiece filled with confetti and sparkles! We mean, who doesn't like confetti? We are going gaga over the Indian version of these beautiful, blue pottery vases used as centerpieces and also the story behind it! How cute are this mini cases overflowing with flowers? We know, even we can’t get over this bag full of cuteness (literally)! How about taking some inspiration form the desert and making your centerpiece decor a little unique? We are totally eyeing the camel and the thoughtful placement of greens around the rustic centerpiece. Give your wedding a rustic country touch with the minimal & raw glass vase table setting infused with dried flowers! 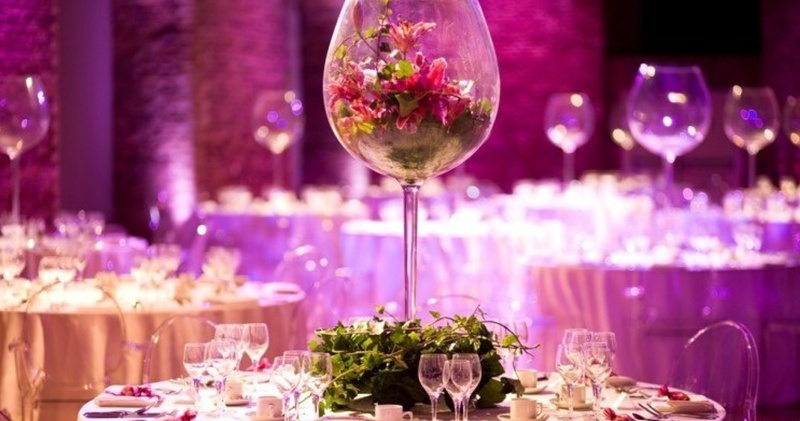 It's really hard to take our eyes off this huge wine glass filled with flowers! So, have you found your perfect pick yet? Colour palette: You'll need to decide what palette you want to work with. Floral or non-floral:You'll need to decide if you are picking flowers or non-floral alternatives. The season can play a role in the selection process, as not all blooms are available at all times of the year. Vibe: The vibe of the rest of your event also matters as you probably don't want modern centerpieces if the rest of your affair is traditional Indian style inspired.